The founders of Striation 6 want their clientele to succeed so much they are betting their business on it. The gym, in midtown Toronto, is pay-per-use. Group classes cost $12, to a maximum of $120 a month. Customers pay $6 to use the equipment on their own, capped at $60. Gyms with locked-in contracts profit from members’ failure to show up; Striation 6 wants to profit from keeping clients coming. “Rather than making people commit to a monthly fee, what we’re committing to is their health,” says co-founder Sam Trotta. Striation 6 is profitable, he says. 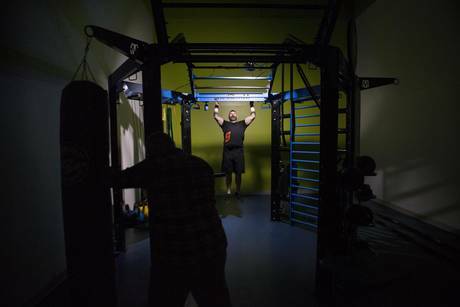 The gym, with a staff of 17, draws a dedicated 500 clients a month who enjoy its business model and fitness philosophies, including muscle activation techniques and isometric exercise. But the company runs a basement gym in a country increasingly dominated by GoodLife Fitness. 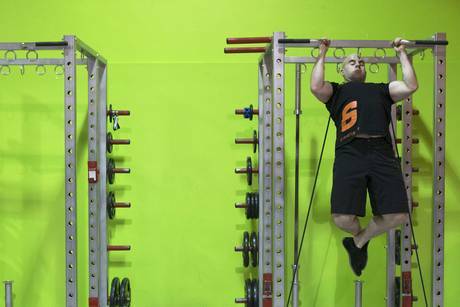 Striation 6, like every independent gym, has to prove that its business model isn’t just different, but better. The 32-year-old Mr. Trotta learned about muscle activation techniques, or MAT, when he was 24 and treating his body recklessly. After working out 14 times a week for too long, he hurt his left shoulder. A friend connected him with MAT specialist and personal trainer Brad Thorpe. “By treating my right shoulder, the pain in my left shoulder ceased,” Mr. Trotta says. He rotates my own long-injured right shoulder to show how little it moves compared to the left. Soon after MAT helped him, he learned how to practise it himself. MAT treats muscles that contract poorly in order to bring balance to the body, relieve pain and restore natural motion. Mr. Trotta and Mr. Thorpe eventually decided to go into business together, taking possession of what used to be a squash club. Striation 6 opened in July of 2014 as a pay-as-you-go haven and a destination for MAT. Because they do not require visitors to sign contracts, members of other gyms can come to see personal trainers and learn about MAT and isometric exercise. On the gym floor, Mr. Trotta sets up an Isophit, an isometric fitness machine that his colleague Mr. Thorpe designed to work out the whole body. Like yoga, isometric exercise involves holding positions; Mr. Trotta gets me to push my arm upward against a locked-in bar and hold it. My shoulder starts aching after 10 seconds. The machine is in high demand, he says, since it helps clients target specific muscles to develop more control. “With control, you can have much better experience in movement-based exercise than you normally would,” he says. We move to a machine for leg extensions. I sit on it and try the slow extensions, pushing forward, not up, as per his direction, trying to target specific quad muscles. The Challenge: How can Striation 6 differentiate its pay-as-you-go model from the contract-fuelled gym market? John Atwood, managing partner, Atwood Group, a health-club consultancy, Natick, Mass. The biggest movement in Canada and the United States is boutiques, and a lot of boutiques, like spin studios, are pay-per-class. The contract concept is still strong, but it’s been breaking down for a number of years. The pay-as-you-go concept is really attractive on the front end, but it does weaken the business’s opportunity to keep people fully engaged. If they’re surrounded by contract gyms, then there’s a real place in the market to advertise – and deliver – that there is no commitment unless you want to commit. Clubs that have no contracts do actually acquire more clients every month. Retention is based on a bunch of factors: the level of results that you get and the level of customer service that you get, making it a social situation for those who want a social situation, and making it really hard for people who want really hard. Striation 6 has a cap on prices – they’re happy to take less of your money, which is generous on their part. With most pay-as-you-go models, you pay more for more, like with auto sharing and prepaid phones. It’s for light users and occasional users. Striation 6, on the other hand, wants to have pricing for the light users but attract regular ones. The pricing model should be separate from the service model. You need to make people feel that they get additional service. The service model needs to emphasize the special care, muscle activation techniques and other special exercise, to attract people to come again and again. Typically, gyms attract local people – they should be aggressive to get the word out in their community. With emphasis that it’s not just different but better – that they have a combination of personal service and special knowledge but also the flexible price. If I said to you, “I’ve got a restaurant, and I’m going to sign you up to a contract and you pay 50 pounds a month and you eat there once a month,” you’d think I’ve gone mad. So why should you be forced to use a health club on the same basis? Over 90 per cent of our members don’t join at the gym – they join online, away from the gym. That’s the key part of the business. There’s no contract, so you have complete flexibility when you join and how long you join for. The interesting metric we’re achieving is longer membership tenure over time. The average life of one of our members is in excess of 26 months, compared with the contract model, which is on average about 17 months in the U.K.
Over 50 per cent of our members tell us they’ve joined as a result of a recommendation from someone. You need to get the ball rolling first, so you need to do enough marketing to create the initial market awareness. When we started, everybody said nobody would come. But 1.6 million customers later, clearly they do. We’re ﻿significantly widening the market. About a third of our membership base tell us they’ve never been in the gym in their lives before. If Striation 6 wants to position its financial and exercise philosophies as the answer to pesky contracts, that should be front-and-centre in its messaging. Given the Gym Group’s experience, Striation 6 could market toward people who normally can’t afford contract gyms or who simply haven’t wanted to spend money on a gym before. The gym’s existing clientele already know what’s great about it and are best positioned to get the word out.